John Kent started this tree service in 1995. He built an honest business focused on quality personal relationships, experience, and providing value-added service using specialized tree equipment to minimize labor, risk, and transporation. Today, Kent’s investment in specialized tree removal equipment provides a competitive advantage that does more than cut labor and transportation costs. Biggest and best in industry, Kent’s tree removal equipment is powerful and efficient and produces a level of quality no competitor can offer at any price. But equipment doesn’t work alone. Kent’s courteous and responsive field team is available for 24 hour emergency service 7 days a week. We take pride in our safe operating procedures, well-trained, uniformed employees, and top-of-the-line equipment. Our arboricultural team takes care of your trees and all your needs as a client. Responsible, honest, and helpful professionals dedicated to your positive experience of our tree service. Trees removal is what we do every day. 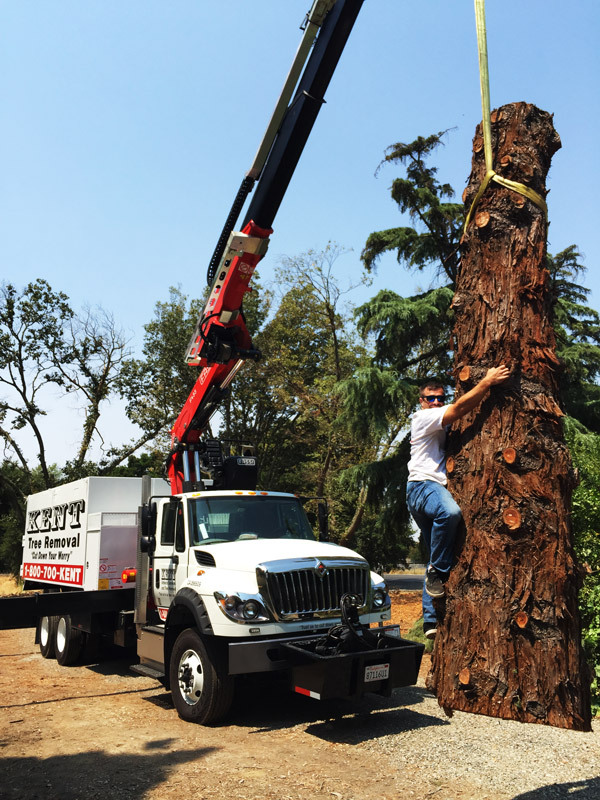 Kent operates the biggest and newest specialized tree removal equipment to reduce the time, risk, and cost of providing quality tree service. While Kent is experienced and equipped to remove the largest and most hazardous trees with ease, it is the personal attention to detail on any size project that makes the biggest difference in creating a positive experience for our customers. Twenty years practicing how to do all the little things that makes the biggest difference. Talented tree professionals using top-of-the-line equipment to provide consistent service. Our competitive advantage over competing tree companies is bigger than the equipment we use. Our expertise and experience ensures other tree services cannot compete with our prices without cutting the quality of service. John Kent owns and manages the daily operations of Kent Arborist Services and Kent Rents. John Kent is a contractor, homeowner, employer, big brother, coach, mentor, BSA Eagle Scout, and UC Davis Alum. The first goal of this document is to build trust by sharing my expertise and eliminating ambiguity. The second goal is to ensure that you understand some of the underlying complexities involved with selecting a tree contractor to trim or remove your trees. Kent discloses all of the foreseeable problems and complications. Some issues we can control; others we cannot. This document attempts to differentiate between the two. More than Twenty years of practicing arbor-culture has taught Kent that tree service is an invasive procedure that is as complex as it is dangerous. If you are shopping for a tree service, make sure you eliminate all ambiguity during the negotiation process. Otherwise, you will not get the value that you believe you are bargaining for. There are many other factors that shady characters can dodge: from using illegal labor or non-carb compliant equipment to not paying workers' compensation, taxes, or other government required fees for doing business. Grounds maintenance workers, including tree trimmers, have a fatality rate that is more than three times that of the average worker in the U.S., according to the U.S. Bureau of Labor Statistics. About 580 people died in tree trimming accidents from 2009 through 2015, according to figures from the Tree Care Industry Association. Kent has received hundreds of written recommendations that his is willing to share with prospective customers. Simply request a written referral and you will receive one. Disagreements between homeowners and tree services are common and stem from the general use of common terms “tree removal” and “tree trimming” and “stump grinding”. Since there is a great deal of ambiguity in these terms, interpretation and agreement is almost impossible, unless these general terms are specifically defined. Understanding these definitions, and how the interpretations of these definitions can vary, gives you the knowledge to negotiate intelligently with any tree service, so that you ask the right questions. This knowledge also simplifies the process of selecting a tree service, while ensuring you receive the quality of service you bargain for. Read about this on our Terms and Conditions page. It was an auspicious day when I happened to see one of the massive Kent Arborist Services trucks parked at the corner of Barton and Eureka. If you’re in need of a tree service company be aware that there are vast differences among them. We all want to hire workers who have integrity, reliability and affability. And I discovered that, when it comes to getting the job done, the key ingredients are equipment, equipment, equipment. My husband and I did the felling and staging of logs and limbs ourselves. Cutting trees down is the easy part. Removing the debris is the most challenging aspect, which is where having superior equipment comes in. We’ve tried a range of options to accomplish the removal of tree debris. The first option is to cut the debris by hand into small pieces and load it into a utility trailer for transport to the dump. We’ve manually filled such trailers more than once. Most recently—after felling one large old Almond tree—that’s precisely what we did. And it took the better part of two days to do it. Such a method is painstakingly slow and tiresome and—given all the debris we ultimately had to contend with—the manual method could have taken the better part of a decade. The manual method may be the cheapest, or maybe not. What is your time worth to you? Hiring a laborer to help is one option. Another option could be to rent a wood chipper, which would speed things up quite a bit. Or you could hire a tree service company to do it for you. They can do the work in a tiny fraction of the time the manual method takes. There is great variability among tree service companies, depending on the manpower they can provide as well as the power and sophistication of their machinery. I’m writing to give you, dear reader, the benefit of our experience. This review may be how serendipity comes to you. It came to me the day I happened to see that Kent Arborist Services truck parked near the orchard on Barton Road. We were in desperate need of a tree service company and had encountered setbacks and disappointments with another company we had used previously. I decided to call the number on the truck. Mr. Kent answered my call and then promptly sent me three short videos of his work. Seeing is believing. The videos spoke for themselves. After viewing the videos I canceled with another tree service company that we had calendared. I’ll give them the alias, Trees-Are-Us. The equipment that Kent had to work with was vastly superior to that which Trees-Are-Us had. More on my experience with them later; first I’ll tell you how it all went with Kent Arborist Services. I called Mr. Kent on a Tuesday and he came to view the job we had on Wednesday, the very next day. The next afternoon, Thursday, he called to say that he could do the job the next day, Friday, and said that he’d arrive before 7:00. The price he bid was for the job itself rather than a “daily rate,” which I’ve learned is common in the tree business. More on that later. Here’s an equipment comparison: Trees-Are-Us had a chipper that they claimed could handle 12-inch logs but, since they didn’t want to place undue stress on it, they would keep the log and limb size to a maximum of 8 inches. Anything larger than that would either be left for us to deal with or they would haul it to the dump for an additional dump fee. In contrast: a Kent Arborist Services chipper can readily eat 24-inch logs and even whole trees. The job consisted of enough tree debris to fill an entire acre and then some; we had also brought down a couple good-sized Live Oak trees that were lying whole in our pasture and in addition had staged a few smaller trees on the roadside next to the fence. Come Friday morning—three days after meeting Mr. Kent—three trucks, four men, two skid-steers and one extremely powerful chipper showed up at 6:25 AM. Astonishingly, it took all of three hours and 45 minutes to complete the entire job, which produced about 100 square yards of wood chips. It was thrilling to watch. The skid-steers were manned by two of the crewmembers, leaving another two men to work on the ground fashioning the debris into ever-greater piles. The skid-steers were capable of picking up massive piles of debris at once as well as large stacks of heavy logs and even whole trees. The acreage they were working on is steep. Pre-staging of the logs and limbs was extremely exhausting; necessitating repeatedly hiking up and down the hillside while dragging limbs to strategically place them. The pre-staging alone took 8 ½ days. In contrast, the skid-steers cruised smoothly and effortlessly across the steep terrain. They repeatedly picked up large piles and were then driven back to the chipper where each load was dumped in turn and quickly grinded into small wood chips. If you’d like to see these skid-steers and the chipper in action go to kentarboristservices.com. Now, for your edification, I’ll compare the efficiency of the equipment Trees-Are-Us had to offer. We had scheduled them to do the job on a Monday, four days before the job was completed by Kent. I was told that they would be here at 8:00 Monday morning. They weren’t. I waited down by the road for them to arrive, alternately pacing and sitting. We were expecting four men; when they finally showed up, there were only two men. The men couldn’t have been more polite and personable. They took a look at the job and said that there was no way it could be done by them in a day, not even close. They explained to me that if they had a third man the work would be divided in the following manner: man #1 would throw debris into the chipper as it was delivered to him, by hand, by man #2. Man #3 would work with a set of loppers, further trimming the limbs by hand because the chipper wouldn’t be able to take them as they were. When the Trees-Are-Us crew showed up with half the expected manpower I telephoned to reschedule. The scheduler told me that they could no longer offer a 4-man crew but could send three men on Friday, four days later. How many days would you guess it would take three men to clear an entire acre of logs and limbs utilizing such an inferior chipper coupled with the manual method? Mr. Kent told me that the California Conservation Core uses a method and equipment similar to that of Trees-Are-Us. He went on to say that Kent Arborist Services has staged competitions with them. Mr. Kent asked me to guess what the work ratio would be: how many days would it take the California Conservation Core to clear acreage that Kent Services could clear in one day? I guessed that the slower method would take ten days, a 10-1 ratio. I wasn’t off by very much. The ratio is actually 13-1. Kent Arborist Services can clear thirteen acres in the same amount of time it takes the California Conservation Core to clear one acre. Being that it was fire season and the debris was drying out by the day, it was a fire-waiting-to-happen. We felt that it was imperative to get the debris cleared as soon as possible. I hated to think how long it could take Trees-Are-Us since, not knowing ahead of time how many days to schedule, and booking day by day, it was likely to be weeks before the job was completed. As I said, we were scheduled for a Monday and when we canceled due to insufficient manpower, we were booked for the following Friday, which would have been a 4-day wait. We went ahead and booked a second day, which was not available for us until the following Thursday, another 6-days after that. And so it would have gone, week upon week, had I not had the good fortune of seeing that Kent truck and decided to call. What is the cost comparison? I asked Mr. Kent, given the slow method and inferior equipment of Trees-Are-Us, how many days he thought the job would take them to complete. He speculated five days, which seemed about right to me. Trees-Are-Us charges, not by the job, but by the day, the so-called “daily rate,” which seems prevalent in the business. The problem with a day rate and a big job is that you don’t know up front how many days it will take, hence you can’t know the final cost until it’s all done. The day rate, which I was told is typical, is $1800. If the job were to take five days, which seemed to be an accurate guess to me, the end cost would have been $9000: $1800 per day times five days equals 9000 dollars. Assuming the best possible scenario, to include the availability of a 4-man crew completing the job in three days, the cost would have been $6000 (we were quoted a $2000 daily rate for a 4-man crew). And that final fee would be an uncertain guess; the job could well have taken more than three days with a 4-man crew. Kent bid on the job itself, as a whole, with a known total cost of $6000. There were non-monetary cost savings, to include the removal of the stress and worry of fire as well as the stress and hassle of needing to keep rescheduling more days week-after-week as the job was slowly whittled away. You may be thinking that you have a much smaller job and therefore a less well-equipped company and the daily rate of $1800 might work fine for you. Let me tell you that I did use Trees-Are-Us for a significantly smaller job a few months earlier. We had staged the better part of our pasture with tree debris and, at the time, I thought it was a big job. Our pasture, however, is much smaller than the acre-plus we filled for the second job, the big one. I’m afraid that I felt ripped off with the daily rate for that smaller job since the day amounted to less than five hours work for the two men, yet we had to pay for a full day. We were told that, in order for the business to survive, it was necessary for them to make a set amount per day, regardless of the time spent. Throughout the day of the smaller job there were disappointments in how the work proceeded. The job was booked to begin between 8-8:30 but the 2-man crew didn’t show up until 9:17. They were good workers while they happened to be working but they had an inordinate amount of downtime, which I was paying for with the “daily rate.” They came with a rented chipper because the Trees-Are-Us chipper was out of service. The men said that the chipper was performing so poorly that they decided to replace it, which meant driving it back to the rental place and then returning with a replacement. I didn’t time the delay but it was significant. During that big block of downtime no work was being done yet the “daily rate” clock didn’t stop ticking. I asked one of the men if they could cut down a small multi-trunked Live Oak tree that had volunteered itself into the corner of the pasture fence, directly underneath the power lines. He said that they couldn’t do that because it was not the job they were booked for. Wait a minute. I thought they were booked for the day, at a “daily rate.” I figured that I should be able to get whatever work was within their skill set and scope of practice during the allotted time of “a day.” They are tree cutters, after all. It was incongruous: they were hired for “the day” at the “daily rate” but yet couldn’t do any work that wasn't initially part of the particular “job.” I call foul to them having it both ways. In contrast to that attitude: early in the day when the Kent crew was here working, I pointed out to Mr. Kent that there was one Live Oak tree that was marked to be felled but had been missed. I asked if he could cut it down. He said that now wasn’t the time but he noted my request. Toward the end of the job I walked over to remind him to find that the tree had already been cut and chipped. Done. Back to Trees-Are-Us: as it turned out, what I had thought was a big job ended up being a leisurely day’s work for their 2-man crew. I had been told that the men never eat lunch but work straight through. I wouldn’t brag about that. It’s a violation of labor law and hardworking men need to eat and drink. In the case of this job, the men did take a lunch break. As it happened, I went inside to eat lunch after they had gone on a meal break. When I went back outside they were still sitting in their truck for a good while afterwards. They left for the day at 4:00. To add insult to injury, a week later I received a text message from Trees-Are-Us requesting an additional $115 for a dump fee. The rented chipper had an especially limited capacity and all logs and limbs that had been too large to feed through the chipper were taken to the dump by Trees-Are-Us for an additional price. In the end the dump fee was waived after I explained the extent of the crews downtime and that I had paid for a full day yet received less than five hours’ work. Bottom line: I’d much rather have a bid on the job itself as a unit, rather than be quoted a “daily rate,” which can turn out to be a rip off if the job is a light one, and which can run into an exorbitant fee for a large job for which the end cost can’t be given up front. Furthermore, with regard to the big job that was done by Kent Arborist Services, the business owners from Trees-Are-Us asked me how many days I thought the job would take. It seems that they (a tree service company) should be the ones telling me (the customer) what the estimated time (and, hence, total cost) would be.